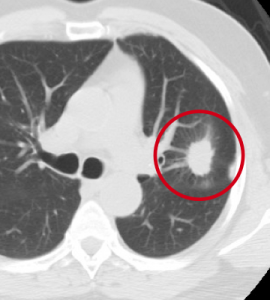 Annual screening with low-dose computed tomography (CT) can find lung cancers in their earliest stage, when the cancer is most easily treated. A large national study involving more than 50,000 participants showed that annual screenings using a low-dose chest CT can reduce the risk of lung cancer death by 20 percent in current and former heavy smokers, compared to those who were screened using a chest X-ray. Duke University Medical Center is an American College of Radiology (ACR) designated center for lung cancer screening. The ACR designation recognizes the Duke Lung Cancer Screening Program for meeting the highest standards in providing safe, effective diagnostic care for individuals at the highest risk for lung cancer. The Division of Cardiothoracic Imaging within the Department of Radiology is responsible for the performance and interpretation of lung cancer screening exams. Our radiology physicians have dedicated subspecialty expertise in lung cancer diagnostics. The Duke Lung Cancer Screening Program — with locations in Durham and Raleigh — provides convenient access to low-dose CT screening for individuals at high risk for developing lung cancer. In addition to imaging, smoking cessation evaluation and counseling is provided as well as follow-up treatment, if needed. A multidisciplinary team of lung cancer specialists in the Duke Cancer Institute is committed to offering the most advanced services to patients — from screening and diagnosis to treatment and beyond — with comprehensive support and education services for patients and survivors. Why should I get screened for lung cancer? Lung cancer is the most common cause of cancer deaths in the United States. Annual screening with computed tomography (CT) scans can find lung cancers in their earliest stage, when the cancer is easier to treat. Results from the National Lung Screening Trial showed that among people at high risk for developing lung cancer, those screened with low-dose CT scans showed a 20 percent reduction in lung cancer-related mortality compared to those who were screened with standard chest X-rays. What is lung CT screening? CT screening is a noninvasive medical test that helps physicians diagnose and treat medical conditions. Low-dose multi-detector CT scans are the most advanced form of CT scans and offer quick and accurate visualization of internal organs. CT screening addresses an urgent need for improved lung cancer screening and early diagnosis of disease, when it is most treatable. A CT scan is able to detect small nodules that cannot be detected by a chest X-ray. Who should get CT lung screening? People between the ages of 55–77 with a 30 pack-year* smoking history who are current smokers or who quit fewer than 15 years ago may be eligible for CT screening. Your doctor or a member of our program can assist in determining if CT lung screening is appropriate for you. * Pack year is a measurement of smoking. One pack year equals 365 packs of cigarettes (smoking 1 pack per day). What are the risks of CT screening? CT screening for lung cancer is safe and non-invasive; however, there are some risks associated with the screening study. Radiation Dose: To minimize the amount of radiation exposure to patients, our radiologists use a special low-dose protocol. False Positives: The National Lung Screening Trial (NLST) found that approximately 25 percent of patients who have CT screening have a positive screen, meaning that a nodule is found in the lung. The vast majority of these nodules are benign (not cancer), which means that most positive screening studies will be a “false positive.” Additional testing is often necessary to determine which nodules represent lung cancer. What happens if the screening shows I have lung cancer? Approximately 4 percent of patients with a positive screening are found to have lung cancer. For such patients, the screening study is the first step in the comprehensive care provided by the Duke Cancer Institute’s team of lung cancer specialists. The Duke Cancer Institute is one of the top lung cancer treatment centers in the world. If you are diagnosed with lung cancer, a personalized treatment plan will be developed by our experts in thoracic surgery, medical oncology, radiation oncology, radiology, and pulmonology to offer the best course of care. What is the cost of a lung CT screening exam? CT screening for lung cancer is currently covered for Medicare patients meeting high-risk eligibility criteria. Many health care plans now also cover the screening study for appropriate individuals. What should I expect on the day of screening? Please arrive 30 minutes prior to your scheduled appointment. When you register, you will be asked to verify your physician and personal information. You will initially be seen by a member of the Lung Cancer Screening Clinic to discuss the CT screening exam and, if you are a current smoker, receive information on smoking cessation. The CT exam will be read by one of our expert radiologists with specialty training in lung imaging. The exam does not require blood work or I.V. placement. The screening exam takes about 10 seconds, during which you are asked to hold your breath in order to limit motion of the lungs. After the exam is completed, you will meet with a specialist in the Lung Cancer Screening Clinic to receive the results of the screening that same day, before you leave the clinic.